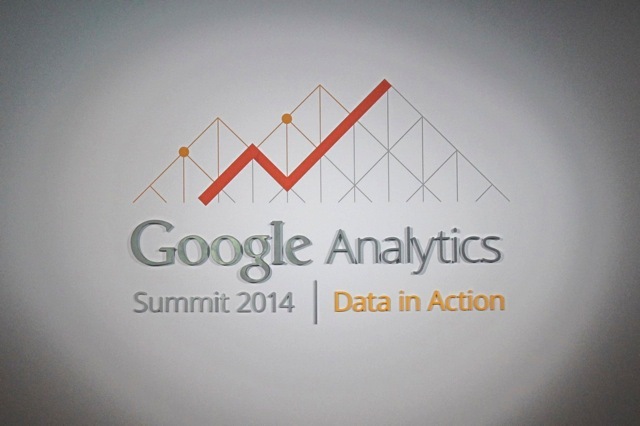 We are back for another year of the Google Analytics Summit. As we have done in 2012 and 2013, Jeffalytics will be live-blogging the keynote experience and sharing reactions as they happen. One thing to note is that this year not every announcement from the keynote is publicly available, so I will only be able to share the publicly available information from the summit. This years conference theme is Data in Action, which is a natural succession to the theme last year of “Access, Empower, Act”. 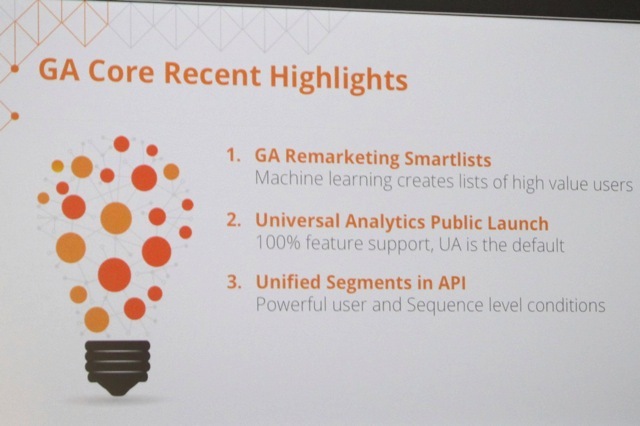 It seems as if many of the announcements will revolve around how do we take action from the data we are collecting, which represents a natural evolution of the Google Analytics product. How accurate will this be? Read on to find out. Similar to the past two years, Paul Muret gave the opening keynote for the conference. This year he was introduced by Analytics Advocate Justin Cutroni. Paul told an excellent story about the events leading up ton an epic 1989 French Open tennis match between Michael Chang and Ivan Lendl. While I will not go into detail on the match, the corollary between sports and analytics is that it takes a combination of skills and adjustments to win a match. 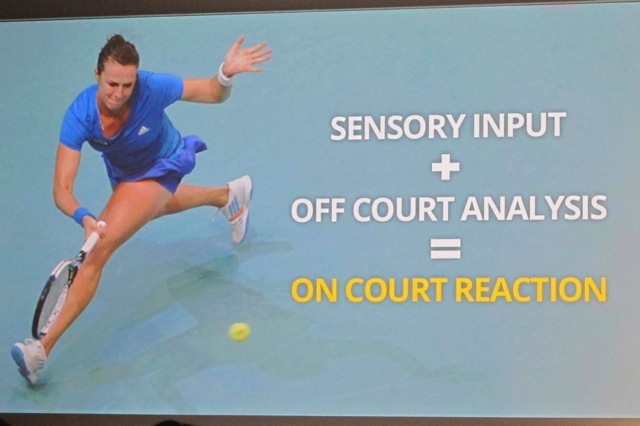 You need to take in all of the inputs around you (sensory input) and also analyze the data you have collected (off court analysis) in order to react to the things that are around you. Using the data that you collect and performing analysis allows you to adjust your approach on the fly, making you a more agile marketer. 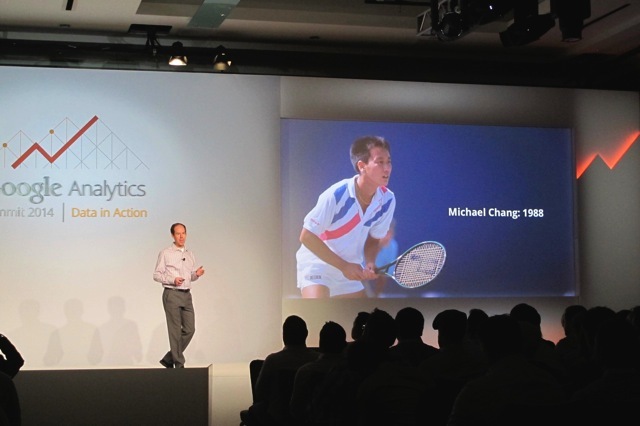 In the case of Michael Chang, he was able to use this input to *spoiler alert* win the 1989 French Open. As marketers, we can do the same thing if we are agile with applying the data we collect to future initiatives. Google Analytics is gearing up to help companies take in the proper sensory data and perform proper analysis to become more agile as marketers. For sensory data, this means collecting data more efficiently using Universal Analytics, Google Tag Manager and several Google APIs. 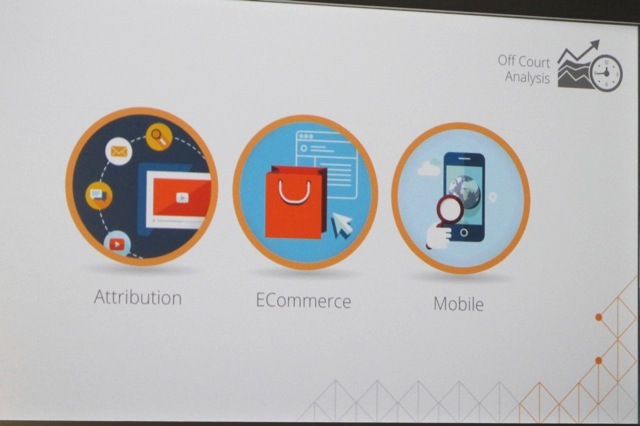 For analysis, Google is providing tools to help us get better at attributing success to specific channels, measuring our e-commerce websites and mobile apps. Agility (and specifically agile software) has been all of the rage in the tech world for years, and it is nice to see Google providing thought leadership in order to get marketers and analysts on board with agility as well. By providing us with the data and tools that we need in order to become more agile, there are becoming less excuses than ever to being a data driven company. Paul’s keynote was very well done and inspiring to the crowd. I liked the mixing of stories and practical product examples to help us understand where GA is going. Now on to the product announcements, updates and my reactions. 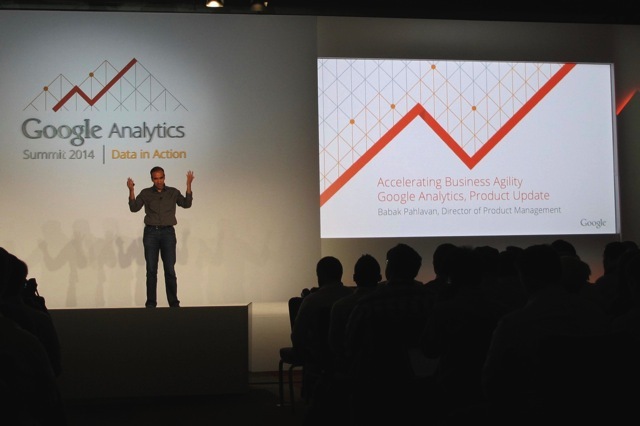 Our second keynote for the day involves Babak Pahlavan, Director of Product Management for Google Analytics. 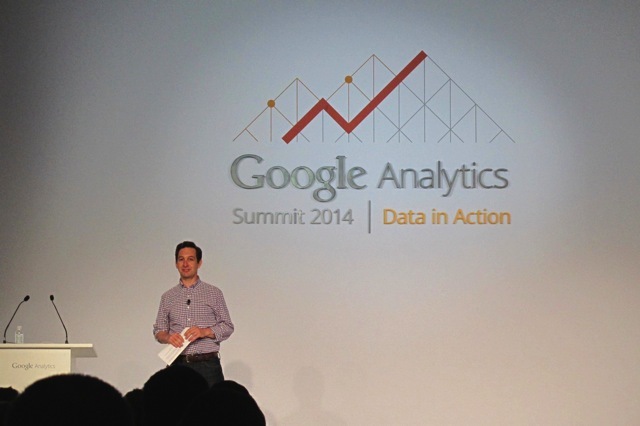 Similar to last year, Babak will be providing us with product and feature announcements for Google Analytics. Like last year, there are 14 announcements that they will be making today. Unlike last year, not every announcement is public, so I will only be sharing publicly available information. Don’t worry, though, there is some really fun stuff to share still! Once again we set the stage for product updates by describing the problem. The Digital World is becoming more complex as we see the proliferation of mobile devices, industry fragmentation and more. We also see the continued merging between the offline and online worlds. For a business to survive, they need to improve their AGILITY by reducing COMPLEXITIES. Google Analytics is one of those tools that we use to reduce complexities and their beautiful interface does make it easier to be agile with our analysis, but it’s still up to website owners to take action. Many of the product announcements will be about making it easier to take action. It’s no secret that I love Google Tag Manager. It makes life easier and is an actively developed product by a great team of engineers at Google. 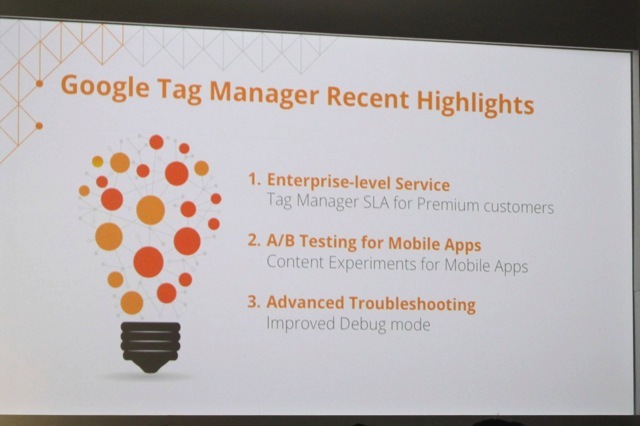 While I don’t think I am allowed to share the upcoming improvements to Google Tag Manager, the recent public highlights for the tool are impressive in their own right. Expect more improvements from Google Tag Manager that are focused on making your marketing more agile, and making the process more accessible to non-technical members of an organization. While there have already been several awesome GA announcements in the past few months, we are getting more! The core Google Analytics E-Commerce reports haven’t been changed in many, many years. In fact, I am pretty sure it’s the same reports we saw when GA was still Urchin software. 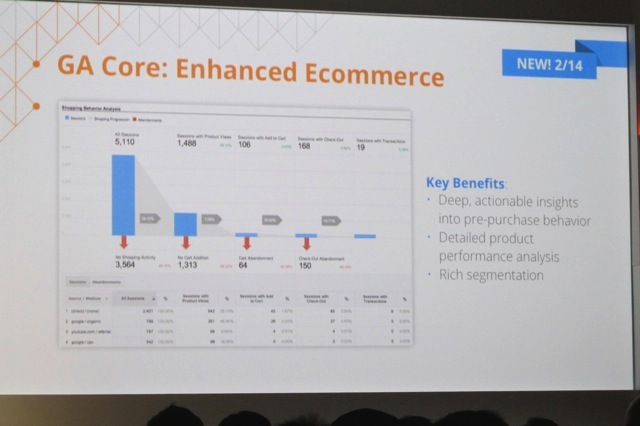 This is the first core improvements to e-commerce in years and it seems pretty awesome. Now we can track cart abandonment, user journeys and segments, product performance analysis and more using enhanced e-commerce reports. Not only that, but they are optimized for remarketing, so if you wanted to remarket to abandoned cart users, you can easily do so with these new reports. Sample usage: Create a list of anyone who added to shopping cart but didn’t purchase. This will make analysis of e-commerce easier and hopefully mean less need to dump data into a spreadsheet for analysis. I’m just glad we finally get to talk about this in public now! This is probably my favorite announcement of the conference, and also matches one of my earlier thoughts on how Google might improve the product. 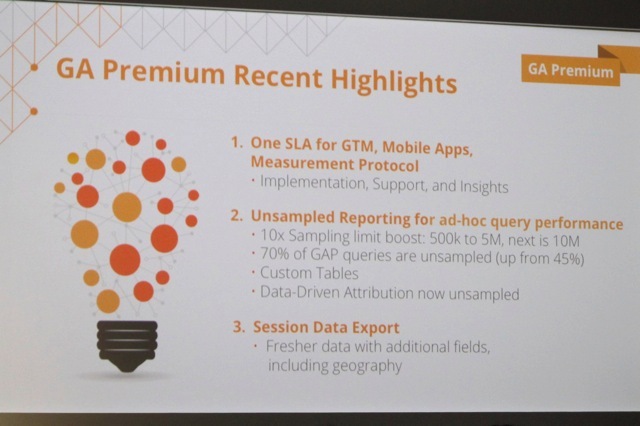 Ever since the announcement of Universal Analytics two years ago I have been waiting for a robust data import capability to become available. 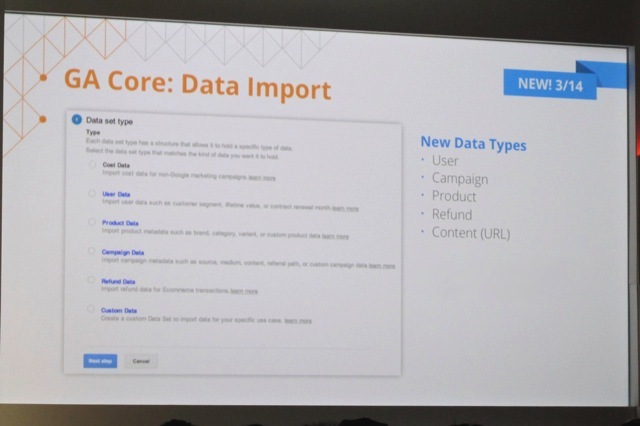 While it has taken a while, we will soon be able to import data into Google Analytics to meet several specific needs by specifying data types to import. This is the beginning of some beautiful analysis opportunities using Google Analytics as a database of record. This feature was announced on the main Google Analytics blog yesterday. Premium GA users can now report on multiple sites and actions in one single view. Want to create an executive dashboard for an entire organization? This is now possible within GA Premium. No tagging required! The coolest part is that you can gain cross visitor insights across domains, with de-duplicated unique visitors across multiple properties. That is a really cool feature and an awesome feat of engineering as well! 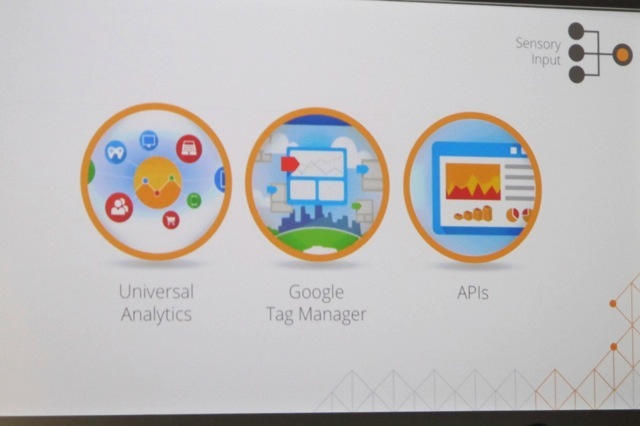 While many readers may not be interested, Google is announcing 4 new APIs for the product. This includes an account provisioning API, an AdWords Linking API, a Filter and Embed API. There are also several enterprise level features that are going into the GA Premium product to link together several Google Products. Check out Google’s official post for more. I hate to do this, but the rest of the features and announcements do not appear to be something that I can publicly blog about. Just note that I am excited about them and I think that you will be as well. Of the new features coming out, one of them made me exclaim “Finally” when I saw it announced, another made me say “wow, that might finally be useful for my clients” and a few others that I could see myself using every single day as an analyst. I will do my best to post on new features and share reactions whenever possible in the future. 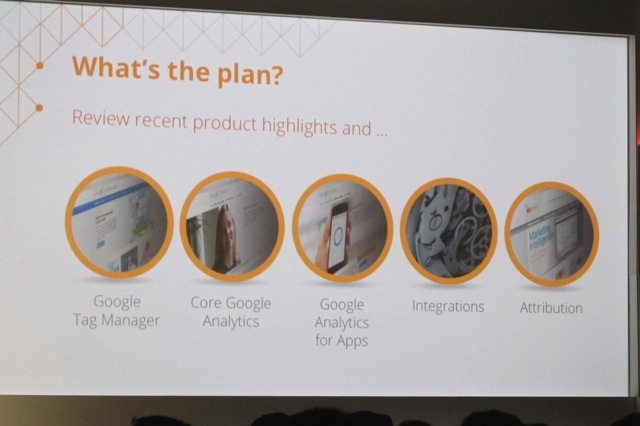 For now I just hope you enjoy this view into the future of Google Analytics! I made three loose predictions at the beginning of the post, so how did I do? Third party integrations – There are several new integrations that will be going into Google Analytics, but it looks like they are mostly shared between Google Products. I would say that this prediction did not come true how I hoped. Further opening of Google Analytics system to developers – This definitely is happening with the data import and increased API usage. I consider this to have happened as predicted. Artificial intelligence to analyze our data – I think that this has happened, but only in a non-public feature. I’m sure this will grow more in the future, but this prediction was accurate. Overall I was pretty close in the areas of announcement. That means I am either well aligned with Google, or they are well aligned with me. Probably the former.